1. Knit the felted clogs - if they work well, knit more out of the pile of non-superwash Cascade I bought in a misguided moment. I did knit a pair and although I didnt like knitting the pattern, I did like the result and will probably knit more. 2. Socks - got yarn for socks in my stash that I should start knitting up, mostly its pretty unexciting wool though which is why it's been languishing. I plan to knit some plain socks for Nigel, and he has also asked for cotton socks. I did knit socks for Nigel, but not out of stash yarn, also for my father. I did knit a pair for myself, and am knitting a pair from stash currently...but then again I have also bought more sock yarn. 3. Ive got some Elann Canapone hemp yarn - I bought this to knit a shawl, I am wavering between knitting something like Icarus, or River. I think the Icarus would look nicer, but River might be more useful. The only disadvantage is that the River I already knitted is in the same sort of neutral colour. Maybe my mother would like it? Must remember to ask...and of course, got to knit it first. My mother did like the River, so instead of knitting another I gave her mine. This is still on the 'possibles' list. 4. Ive been sitting on this bag of Como for a year - I think it needs to become a sleeveless jacket. I want a long knitted cardigan/coat, but probably not in bright orange. Looking for a pattern for this. I cast on to knit a coat in this but I really am not keen on the knitted fabric. I put it aside for next winter - but need to find another pattern, maybe one designed for the yarn. 5. I want to knit some Fetching mittens and I have a ball of Cashmerino aran. If the pattern is nice to knit I can see me knitting more than one pair. Well I have knit 5 pairs! 3 were gifts, one for Finlay, and one for myself. 6. Christina and I are planning a knitalong for the IK Swallowtail shawl, and I already have the Misti alpaca that the pattern calls for. No reason not to do this - apart from I'm already overloaded with shawls, however pretty. Maybe this would be a nice thing to knit for Eileen? Still planning to knit this, although now I have the Victorian Lace Today book there are so many more appealing patterns in there, Swallowtail is slipping down the list. 7. I just bought some Elsebeth Lavold silky wool to knit the cabled cardigan in Vogue Knitting this month. Its the only pattern in the entire magazine that I like, but it calls for a 100% cashmere yarn...I like silky wool so I'm hoping it will be a good substitute. Little cardigans are actually knitwear that I will wear a lot. I knitted this into the Bonsai tunic - and am very pleased with the result. 8. Got 800 yards of this linen/cotton mix, probably be a summer top for me. Still in the plan, probably the v-neck sweater out of the Rowan Summer Tweed book. 9. Got to knit something out of the stuff I dyed - maybe mittens - but again, if I dont do it soon will not be needing mittens for a while. Yep, this became 2 of the pairs of fetching mittens. 10. I bought a nice pattern for a lacy scarf - Ive got some nice yarn that would work for it - but cant decide which. Hmm....patterns for lacy scarves seem to have proliferated recently, along with yarn in which to knit them...I forsee a lot of lace this year. 12. Got some Malabrigo to knit into a hat for me, again, if I dont do it soon, wont be worth it until next fall. Its warm already - shelved until next winter. Immediate next thing on the needles is going to be a camera case for Adam, and that has not even made it onto the list! I did knit the camera case, but Adam dropped the camera, so it has not had much use. So, what is added to the plan? A knitted scarf from VLT in Seasilk that I bought at Stitches. 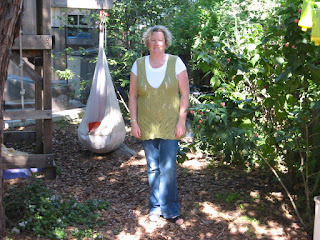 I finished the Bonsai tunic and am very pleased with the result. I wore it all day today. The pattern is by Norah Gaughan from Spring 2007 Interweave knits. I knitted it in Elsebeth Lavold Silky Wool. I did modify the pattern to eliminate the waist shaping (!) and I left out the belt. I also finished the sleeves with a crochet edging rather than the 3 row knitted edging. It was a quick and easy knit, although I did make a mistake in the front that I didn't notice until much later, and as a expedient knitter, decided that as I had not noticed, neither will anyone else. I anticipate that it will get quite a lot of wear. While my parents were visiting I knitted socks for my father. I got the wool at Stitches, and once that met with approval I cast on for some basic stockinette socks. The wool is Fleece Artist superwash merino in the Cosmic Dawn colourway, and again, the Fleece Artist will is so soft and an absolute delight to knit. Since despite much talking about photo shoots, I didnt actually take a photo of Farve modelling the socks, here is a photo of him wearing them. Well, you cant actually see the socks - but look at how pleased he seems with his comfortable feet! 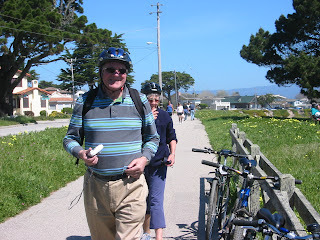 The photo was taken on East Cliff Drive in Santa Cruz when we all (6 of us) went for a bike ride. Our visitors have gone and our life has reverted to it's usual slow pace. M&F may feel that their visit was also at a slow pace - but these things are relative right? 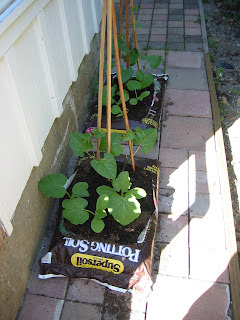 The boys continue to be thrilled with their garden, shown below are green beans and pumpkins. They have been good at remembering to water them. Adam has also been good at performing his 'chore' which is taking kitchen scraps to the compost bin...another M&F legacy. Since he did composting at school he is delighted to be doing it here and he cant wait for the worms to move in. At that point I will be even more pleased that Adam is in charge of the compost. Finlay has also been productive. This is the bee trap. In fact it is a trap to catch wasps, but allow bees to thrive. The idea (as you can probably see) is that the wasps slide down the stick and bang their heads on the stones at the bottom. It really needs some water added as it seems to have evaporated. The water is then to drown the wasps - but the bees can escape in the pistachio shell boats. Simple but genius. I mentioned previously that I bought a drop spindle at Stitches West. 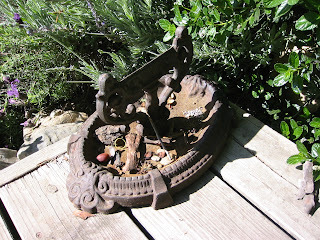 Its a Shacht spindle which can be used as either a top whorl or bottom whorl. Im using it as a bottom whorl at the moment. I also bought some pretty roving to practise with. 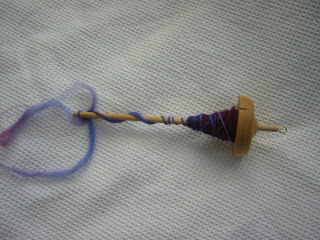 My spinning is pretty poor, but its fun, and quite relaxing to do. I cant see that I will ever spin anything that is actually usable but I have already got my full money's worth from this spindle! ($16). Adam's class are studying Fabric at the moment. Last Friday I went into school to show them knitting and spinning. The knitting part was less interesting as the children could not really try it at all, but they all had a go at the spinning. Its a pity I dont have any photos of this event - but I had great fun - and while I am a pretty bad spinner, I am better than a class of 6-year olds. The best part was that in the classroom they have a display including a home-made spindle with some unprepared fleece attached to it, to try to minimize the queue around me spinning Adam's teacher asked Mammie to help. Although she had never picked up a spindle before, she gamely used the classroom spindle with some of the children! So between us we had 20 children spinning yarn on Friday morning. One of the mothers was talking to me about it later and relayed that her son had come home from school telling her that they had made string with a thing that twirled around...she was completely mystified. It was great fun to go into the classroom and be able to do something that was apparently so interesting to the class. This last weekend Nigel and I took advantage of my parents as babysitters, and went up to San Francisco for a couple of days. We stayed at the Hotel Adagio near Union Square. We had a great time. The weather was terrific, so we were able to walk all over town, as well as eat our lunch on the harbour-side. 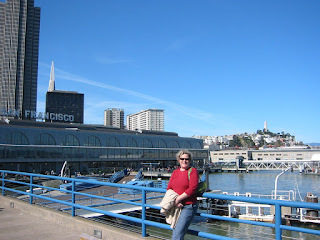 We visited the Ferry Building for the first time which is delightful, we ate fresh crab in the sunshine. The building is fairly recently restored and is now a foodie-winey paradise! We also managed to get to see Beach blanket babylon which was a riot. I saw this show about 20 years ago, and didnt get many of the jokes, which are topical, and often local. After 10 years living in the Bay Area I found I was able to laugh at many of the comic references, and also at the unabashed silliness...what's not to like in a show that climaxes with the wedding of Madonna and Elvis! Our weekend was planned to celebrate my 10th anniversary of moving to California (March 1st 1997) but also co-incided with the Chinese New Year parade. Along with 500,000 other people we lined up along the parade route. 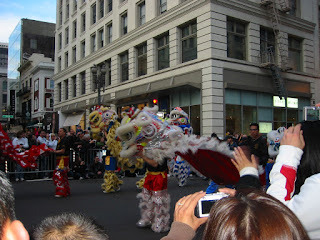 The parade actually lasts several hours, but we didnt stay for the entire time, but we were there long enough to see the SFPD Lion Dance team! We also made time to visit the wonderful ArtFibers store. They sell only their own yarns, but what lovely yarns in such beautiful colours. Because all the yarns are unique to their store, the provide a swatch for every yarn in every colour, and also balls of yarn for your own testing. I came away with a single skein of recycled sari silk, but with a silent promise to myself to return once I've knitted up some of the Stitches wools. 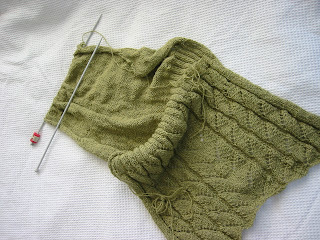 I'm currently knitting the Bonsai Tunic from Spring 2006 IK. The designer is Norah Gaughan, and Im knitting it in Elsebeth Lavold Silky Wool. I'm loving knitting it; the silky wool is a perfect colour for me, its quick to knit, and feels lovely. I bought the wool for a little cardigan, but I loved this tunic in IK and had to cast on immediately. I saw a sample knitted at Stitches West in the recommended yarn (Bamboo) and it looked great - hope it looks so nice on me.